EghtesadOnline: Both foreign exchange and gold markets on Monday kicked off their rallies after days of relative calm, with major foreign exchange rates registering significant gains against Iran's national currency. According to Tehran Gold and Jewelry Union, the US dollar suddenly gained as much as 7.5% or 3,300 rials in Iran's capital to be traded for 48,230 on Monday. The European Union's currency climbed 2.5% or 1,350 rials and was quoted at 57,440 rials in certified exchange shops. 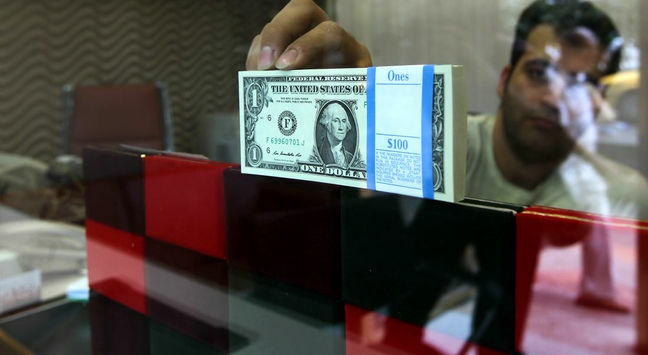 The price jumps come after the past two weeks' interventions by the Central Bank of Iran, which led to black market speculators being rounded up with the help of the police and the issuance of rial certificates of deposit to curb foreign exchange rates, according to Financial Tribune. The situation had resulted in three rates prevailing in the market. The first was the official rate announced by CBI, the second was the CBI rate at which major currencies were offered by CBI-certified money exchanges in a limited manner and the third was the rate presented by downtown Tehran street traders. CBI has increased its rate for the certified money shops, meaning that the rates have been synchronized with free market rates. In the gold market, the benchmark Bahar Azadi gold coin also gained 1% or 145,000 rials to change hands for about 15.96 million rials ($331). According to Mohammad Keshti-Aray, the head of Iran Gold and Jewelry Union, a price bubble running as high as 1,200 rials currently exists for the benchmark gold coin. "Many had invested in the coin market to sell their coins at the right time and when prices go up," he told ISNA. "It is with this capacity that deals have gained steam and if this wasn't the case, the coin price bubble would be much higher," he added, noting that the approach of the new Persian year (starting March 21) has also naturally added to demand in gold and coin markets. The official predicted that the price bubble will be depleted by the time the Norouz holidays are over some three weeks from now, as supply and demand will subside. Keshti-Aray said rising foreign exchange rates have increased prices in gold and coin markets at a time when global gold prices have remained stable. On Monday, Bank Melli Iran, the entity in charge of running CBI's gold coin presale scheme to curb prices and foreign exchange rates, announced that about 820,000 gold coins have so far been presold while more than 400,000 coins have been sold at auctions.